Hey guys, I'll be running an arc on the Saturn! This time, we won't be constrained for time, so you'll be able to more thoroughly explore your options in the mission, without me bearing down with constant quick actions. I hope you'll bear with me, as I'm still learning, however, I think I've got a pretty good story to tell, and James has signed off on it. So enjoy! By order of Starfleet, the science vessel USS Saturn has been ordered deep into Cardassian space to observe a gaseous anomaly near the Kelvas system. The anomaly is benign, but should provide valuable data to help further our understanding of the expansion of the universe. The Cardassian Union is aware of the Saturn's mission, and has offered their hospitality should you need it during the mission, however Starfleet Admiral Nil has been adamant that the Saturn is to get in, conduct their scans and get out. The Cardassians have requested that the Saturn keep weapons systems offline during their time in Cardassian space. The Saturn is currently orbiting a neutron star a day out from the Sigma Rho, and will take several days at Warp to reach the Kelvas System. Admiral Nil of Starfleet has requested daily updates on the Saturn's mission. Sunday's mission will begin in orbit of the neutron star on the border of the Badlands. Last edited by Jack Lucas on Wed Mar 05, 2014 4:41 pm, edited 1 time in total. We have another wonderful opportunity to study the wonders of the universe and I hope that all officers will help and contribute while we analyse this gaseous anomaly. The Cardassians have been very courteous in allowing us access to their space to study this, but I agree with Admiral Nil that we should go in, study the anomaly as necessary and then leave Cardassian space. OPS: Please ensure that the power systems are operating correctly and we don't have sudden energy spikes that might make the Cardassians think we are preparing our weapons. I don't want them to have any excuse of us not sticking to their terms are we pass through their space. NAV: Set a course for Kelvas space. Please also assemble an itinerary report for the Cardassians if they end up requiring one. TAC: I do not like it, but we will need to keep weapons powered off while we are in Cardassian space. Please ensure that any routine weapon test is suspended while we are engaged in this mission. MED: I don't expect any casualties during this mission, but keep the sickbay ready just in case. If no medical emergency occurs, please be ready to assist SCI if the gaseous anomaly turns out to be biological. SCO: This is a wonderful opportunity to study something new, so please ensure that all sensors and scanners. Please brief me and SCI on all data currently known about the gaseous anomaly. SCI: Please prepare the necessary probes in order to study the anomaly. Also be prepared to collect and study gas samples if the opportunity presents itself. ENG: Work with OPS in order to ensure we don't get any unexpected power spikes. Also ensure that the warp engines are running at full capacity: the last thing I want to do is ask the Cardassians for help if we somehow get stranded in space. AUX: Welcome aboard the USS Saturn, Cadet. Your medical knowledge will be of great use through our travels. I want you to work with MED in order to study further the effects of the Chronaton radiation on the ship and crew. I know we are on a fragile situation here with the Ferengi and some of you might be wondering why I am co-operating. 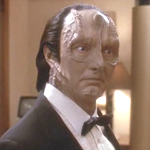 Please remember that, as long as the Cardassian requests are lawful, any refusal by us might be used by the Cardassians as political leverage: this, of course, is not a situation we want to fall into. OPS: Please keep constant communications with the Cardassian vessel: if they close the hail, let me know since they might be planning to attack. NAV: Keep us at a constant distance from the anomaly: if necessary, be prepared to get us on a course back to Federation space at best possible warp speed. TAC: While the Cardassians are within our ship and 'inspecting it', please ensure that all our 'visitors' are accounted for and that they do not stray from a designed path around the ship. I do not want them snooping where they shouldn't. MED: We hopefully should not descend into combat, but be ready at a moment's notice if fighting does break out. Also, work with AUX to get a permanent solution to the chronaton radiation problem we are experiencing. SCO: Keep analysing the anomaly: I know that the there is little to see but let's make this trip worthwhile. Anything that we can gather from it will be useful once we debrief back into Federation space. SCI: Help the SCO in his scans, but if possible, ran some covert scans of the cardassian ship: I don't want them to pick up anything, so disguise it as regular scans of the anomaly. ENG: Please make sure your entire crew is wearing rad-suits while in main engineering: I know its unwieldy but its better than the chronaton radiation affecting the crew. AUX: Keep working on the chronaton radiation problem: I want a permanent solution before we get back to Federation space if possible. I apologize, everyone, for missing yesterday's mission. I thought I had notified James of my absence, but I must have forgotten. I was very excited to spend the day up in Kansas City at Planet Comicon, where I went to the Trektacular event. William Shatner, John deLancie, Jonathan Frakes, Marina Sirtis, Gates McFadden, LeVar Burton, Michael Dorn and Wil Wheaton did a panel, and it was phenomenal. I'll be here this week, for sure, and I'll let you know about any future absences. Again, my deepest apologies. Gonna have to apologise for missing today, had other things on my mind and completely forgot! So sorry about that, will make sure to be there next weekend! We are in a bad situation: all of our systems have been sabotaged and we have been locked out of all our systems. Although the perpetrator has fled, we are in no position to chase him so our priority should be to fix our ship. Fortunately, the friendly Cardassians that came to save us might realise our position and come to our aid. OPS: Make sure that we gain back power as soon as possible. We are in a dire situation and I want all personnel available to get us power back. NAV: It'll be necessary for you to work with Operations and Engineering while we are dead in space. TAC: I want a full investigation on how a saboteur got into our ship, especially since he's not listed as a crewman. Make this your priority after helping the ship get back into control. MED: Stabilise the patients as best you can: I know that without power it will be difficult but unfortunately there isn't much we can do before power is regained. SCO: If we can get scanners back, I want you to scan our ship and see if there is anything unusual inside or outside of the Saturn. SCI: I want you to run a deck by deck sweep using tricorders only. I know it will be tough but this a dire situation we are in. ENG: We need power back, ASAP! Make sure that all possible resources are diverted to getting us back in control of the ship. AUX: Help MED with any casualties we might have had during the attack: we'll have to use the old fashioned methods due to our lack of power. Unfortunately I won't be in tomorrow due to unexpected issues.